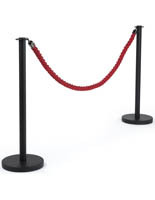 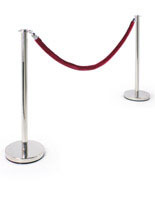 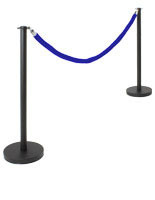 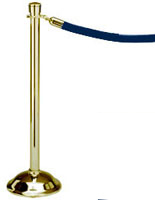 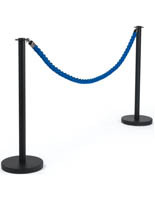 Classic Rope Stanchions for Red Carpet Events! Did you know that crowd control systems come in many different colors and styles to meet any need? 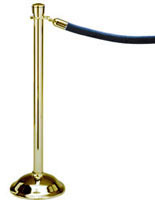 Rope stanchions like these provide an elegant appearance and are great for theatres, restaurants, banks, museums, clubs and other venues. 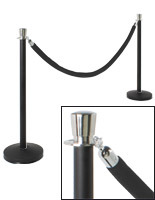 Unlike retractable belt models, posts with velvet cording simply belong in more upscale environments. 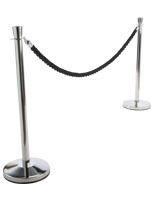 In addition, the rope stanchions can be used to block off areas from visitors, marking them as inaccessible. 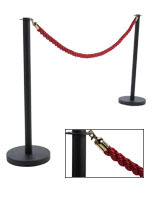 Each decorative fabric cable measures 78” and keeps poles 72” apart. The posts can be hooked together in various patters, from the zig-zag pattern for maximizing floor area, a layout often seen in banks and airports to a perfectly straight line to delineate a simple queue. 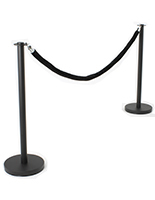 Rope stanchions, also known as waiting line barriers, offer a modern look that blends in with any retail or commercial environment. With a variety of colors and styles to choose from, stands like these can complement or coordinate with any décor. 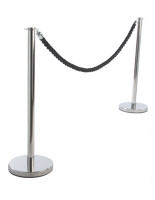 What features are available with these crowd control systems? 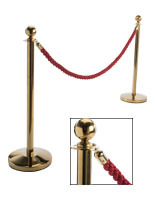 Rope stanchions are offered in (2) elegant styles. Each design is compatible with the sets seen here. 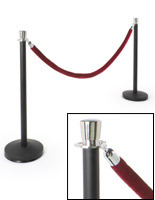 Upscale velvet ropes feature a smooth and basic appearance ideal for any environment. 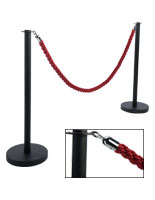 These come in an assortment of colors including black, royal blue, bright red, hunter green, maroon and more. 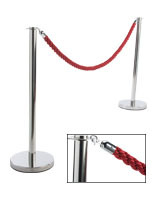 Barrier ropes are also available with a decorative twisting nylon design. 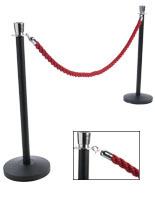 These cables are available in red, blue and black and make ideal accessories for lobbies as well as service areas. 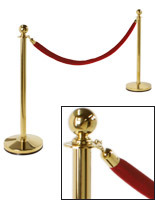 Each velvet or nylon belt also features brass or chrome hardware. Posts also vary in finish. 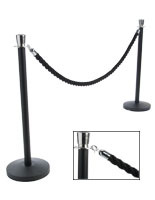 These rope barriers are offered in a professional matte black, classic shiny brass and modern polished chrome. 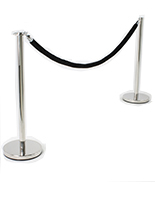 Stanchions can be mixed and matched with different accessories for creating different layouts and aesthetics. Guiding customers with these attractive displays will give any business a professional air! 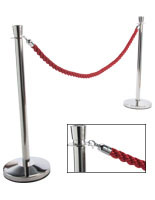 Stanchion tops come in different designs for the choosing. 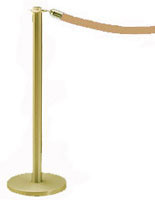 Tulip-style heads have a squared construction and offer a classic look. Flat-tops are simple and used by outlets seeking stands with a modern appearance. 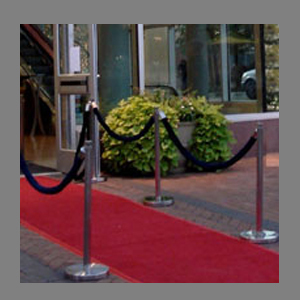 Rounded heads look great at red carpet and other upscale events and feature an eye-catching design. 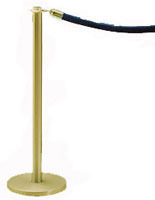 These toppers have a chrome or brass finish and can match the color of accessory hooks. A waiting line system is an excellent choice for organizing and directing people. 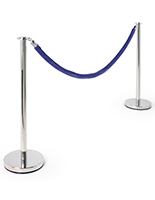 Each post includes a four-way adapter for creating a connected barrier arrangement. This allows users to create patterns that bring patrons to counters or doorways as required. 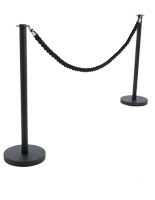 Additionally, these kits can act as barricades for exhibits in museums, inaccessible entries and closed counters. 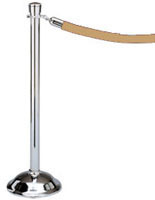 The posts also include weighted bases for remaining stable even in high traffic interiors. Our rope barriers ship unassembled but can be constructed in minutes. 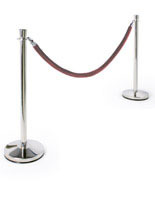 In addition, they can be disassembled quickly and easily for transportation.